Some sense at last as rugby bosses reveal new plans. AFTER THE RECENT battle with the country’s rugby clubs over the cost of tickets to international games, the IRFU has announced a new tiered pricing structure. The plan will see adult tickets priced at €50 to €125 for the RBS 6 Nations in February and March 2011. The new policy will not involve the linking of games – as has been the policy previously. Tickets will be sold in five categories with tickets in the single biggest category dropping in price from €100 to €90. Importantly, 1,800 schoolchild tickets will be available at €15. The Aviva Stadium has a capacity of 51,700 seats. 21,700 of those seats are committed to IRFU programmes across advance 10 year premium ticket sales, advanced 10 year ticket sales (2003, 2005), visiting Union allocations, sponsors, former internationals, press box, corporate hospitality programme, corporate boxes and committee box. 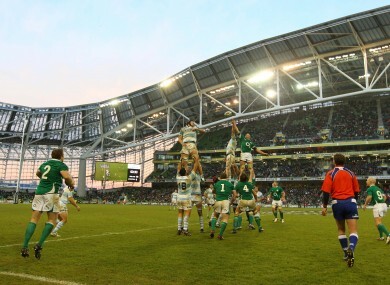 The remaining 30,000 seats (approximate), which include general admission seats and seats at premium level, are committed to the branches for dissemination amongst the constituent clubs of the IRFU. ‘This new tiered pricing structure will see the introduction of five general admission ticket categories for these two RBS 6 Nations matches. Declan Kidney’s men only have two home games in the forthcoming 2011 RBS 6 Nations championship with France and England next year visiting Dublin. I believe our new approach, which reflects input from our branches, our clubs and the general public, will go a long way towards balancing the requirements of the differing constituents. The new structure sees a reduction of between 10% and 62.5% in the ticket pricing from category 1 to schoolboy/schoolgirl tickets. In approaching the issue we were tasked by the Union to come up with a pricing structure which would provide attractive options to supporters at various levels and secure capacity crowds for both France and England. We also needed to be cognisant of the key role international fixtures play in generating the income required to manage and develop the game at both the domestic and professional levels. Email “New ticketing structure for rugby fans ”. Feedback on “New ticketing structure for rugby fans ”.